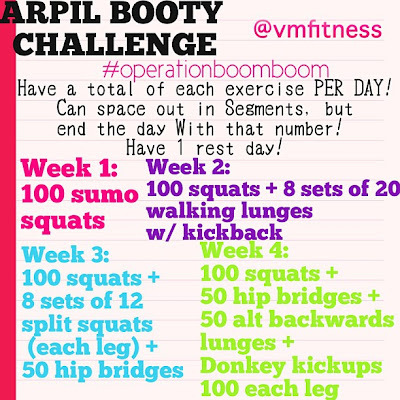 VMfitness: #OPERATIONBOOMBOOM Grow your Glutes Challenge! LETS MAKE APRIL A GROW YOUR BOOTY BOOMBOOM MONTH!!!! Each week has exercises - end EACH day of that week with that number of the specified exercises! These can be bodyweight, or if you want to make it extra tough, go ahead and add some weight! You can space them out (example: 20 squats 5 times a day, 50 two times, etc). If you don’t know what the moves are, google them!!! And have 1 full rest day a week! I'll try it!!! when do we start? Is there a may, june, & july or is this the only one?